This morning, I had to go to town, to pay bills, and get food in for the weekend, after which it was back to work, and boy! did I pay the price. 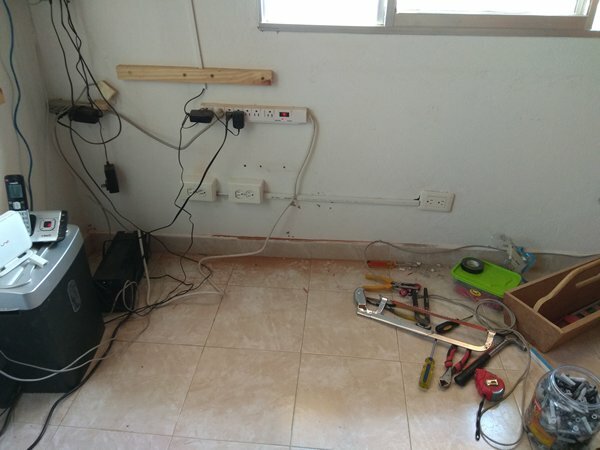 I finished the electrics, the original socket in the middle of the wall will not be used, as it will be behind the drawers, now I will fill the old holes, and then paint the room, after which, I can finish and install the desk-top. We have now gone three days without the Barbers shop opening, it is definitely too much to hope it is permanent, but it has been very peaceful while it has lasted. Marcela has decided to take tomorrow off, as a result of the stressful week, her Mother suggested she take today as well, but Marcela thought that was too much for her mum. I will be nice to have my Wife for an extra day this week, she will probably spend most of it in bed sleeping, but at least she will be here! There are no visitors at the Fincas de Recreo near to us, tonight, so we had better make the most of it, I am sure they will be here tomorrow. Our brief respite, and good relationship with the Mayordomo alongside us, seems to be over, last week-end he declared that he wasn't taking responsibility for the noise made, and they could make as much noise as they wanted, he soon shut up, when I thanked him for sending the message as a voice message on Whatsapp, so he can't say he has been illegally recorded, we now have the evidence! He has also upset another neighbour, who asked him to do something about the rat infestation, as they were running from the Finca's land into her garden, I have to admit, I have seen no sign of them, but it's entirely possible after the flooding, anyway, he told her that rats were par for the course, and he wasn't doing anything, I bet Visitors to the Finca, would like to hear that.